The Karambit can be carried in numerous positions and the "best" is the one that best suits your needs and intended use. 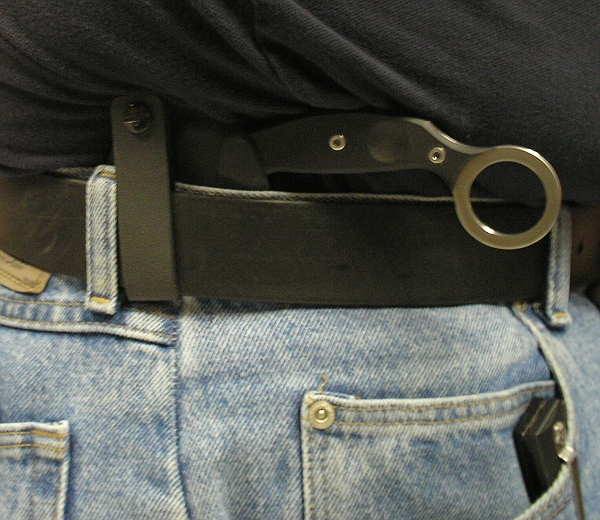 It can be carried around the neck, concealed or not concealed, in cross-body carry position, in front or behind waistband, inside or outside of your belt, in the front or back of the torso, side carry standard (handle up), reversed (handle down), in a thigh rig, or numerous other ways. There are other methods but for all practical purposes these are the most common. Additionally, for the waistband carry, and depending upon your access preference, the knife can be placed for cross-hand draw or same-hand draw in both the front or rear positions. Although somewhat obvious, prudence reminds us that if you are right-handed, then you should carry your blade positioned for streamline access with the right hand. Conversely, if you happen to be left-handed, then you should carry your blade positioned for streamline access with the left hand. Some people are truly ambidextrous and can use either hand effectively as the other. If you happen to be one of these naturally gifted knife-owners, then you are blessed with not needing to bother with strong- or support-hand selection. You should always carry your karambit in the same place. Should you need it in a hurry, you don't want to have to add the very slow step of thinking, "Where did I put my knife?" Imagine getting into your car in the morning and every day someone changes the position of your brake, clutch and gas pedals. Sure, you'd figure it out after a while, but in an emergency you'd better know where to find the correct pedal. 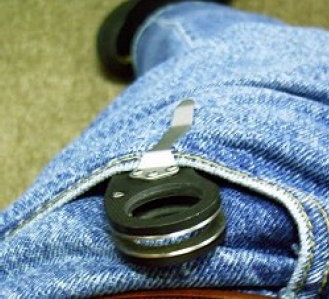 Same thing with your knife - once you decide on a carry position that fits your personal profile and usage needs, don't change it! The safest and most efficient deployment of any tool is a smooth transition that begins with a secure grip, continues through the draw and ends with the tool ready for operation. 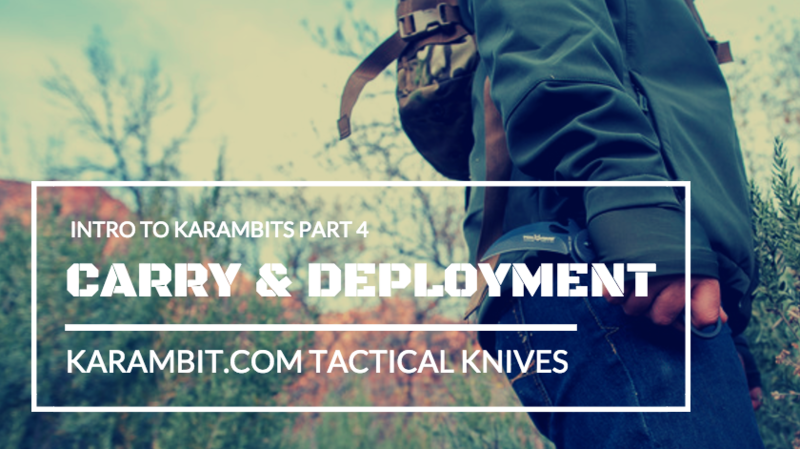 Carrying your karambit isn't enough - you also have to practice deploying it. When it comes to fixed blade karambits, deployment is simple: grab the handle and pull the karambit out of its sheath. Folding karambits take a bit more planning as you don't want to dig around in your pocket for it when needed. Invest in a folding karambit with a clip to ensure your blade is always ready for quick and sure deployment.